Loosing position while machining a project can happen for a variety of reasons. sometimes the work is damaged beyond repair and sometimes all you need to do is reset your cutter back to the origin point and resume cutting. While the destruction of a piece of work is a blow that we will all eventually suffer the 2nd senario can be the more frustrating. a perfectly recoverable piece of work if only there was a way to find the origin point and continue from where it left off. This video highlights 4 ways of resetting a cutter to the table if you loose position. The difficulty of the recovery process will depend on whether you take the extra minute and plan ahead when you create your files or you decide it will never happen to you and take the chance. Ultimately accuracy of the reset cutter will depend on what method you use to reset and if you are doing it manually how much time you invest in getting it right. When it comes to ease, speed and accuracy you can't go past using electronic methods such as the tripple edge finder. 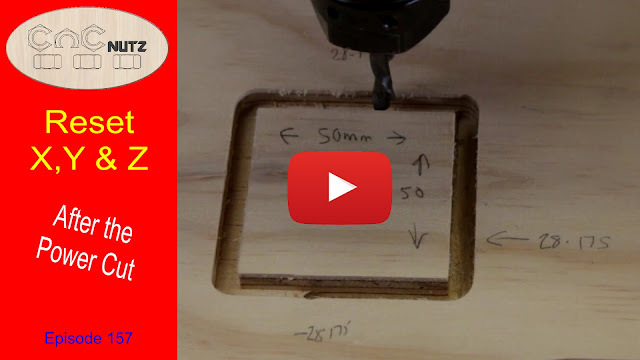 The next best option is the hole method demonstrated in the video. After that it gets much harder and accuracy will vary. I found the slot method or setting the cutter particulary frustrating because I filled in the X coordinates into the Y DRO in my controller software and had to restart. It is not dificult but if you aren't paying attention you can easily make a mistake. Since I do not have homing switches on my machines and have never used a machine with limit switches I cannot comment on if they are useful for resetting or not. If someone can point to a video demonstration of the recovery process then I will update this page and put a link to the video for those interested. At the time of making this video I did not have UCCNC but both softwares are very similar in operation. If you are using an automated spindle make sure you have the Estop switch at hand in case the spindle does not start turning when it restarts the cut. In hindsight and on both controller softwares I would manually start the spindle just to be on the safe side. Personally I am still getting used to an automatic spindle and I can honestly say I am still can't get used to it. I do like the auto stop feature though. This product designed and made in the USA by Bill Griggs is a versitile piece of kit. It probably has far more uses than most people realize and if you are looking for a product to reset your X,Y & Z position you would be hard pressed to find anything better. If you are interested in this product check out his website and the various tutorial videos he has on installing it into Mach3 and using it. The 2017 Screenset for UCNCN from www.thecncwoodworker.com has built in centre finding and auto Zero that should work well with this product. I do intend to test this out myself in the near future. If anyone has additional information regarding the Triple edge finder and UCCNC please let me know and I will update this. As usual your thoughts and comments are always welcome. Thank you for taking the time to read this and until next time. Glad you find this useful. Lets hope you never need it but if you do it pays to be prepared. If you practice now then when the real thing comes along you will be ready.